Batman Arkham Knight is a third person open world action RPG and it is the fourth and rumored to be the final game in the series. But, even if that is true we cannot believe that this will be last game from Rock Steady about Batman. Arkham Knight is in the same style as the previous games but it is rated M for Mature so it has some elements that are much more violent. It is Halloween night in Gotham and Scarecrow has taken over forcing a city wide evacuation as he threatens to release his new Fear Toxin. But he did not do it alone a man calling himself The Arkham Knight has an army that overwhelmed the Gotham City Police Department. Now Batman has to lean on everybody in his circle from Oracle to Commissioner Gordon to stop the Toxin and figure out who the Arkham Knight is. 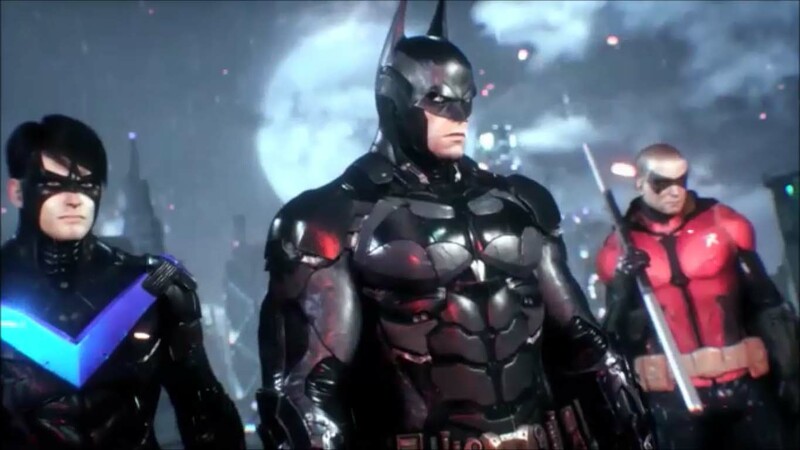 Batman Arkham Knight starts off quick and does not back off. You are thrown in a disaster where the streets are filled gangs and people rioting so there is no learning curve, you are right in the middle of hand to hand combat right away. The fighting system has always been good in this series it is even better in Arkham Knight. Your attacks are much smoother making it easier keep combo streaks going while pulling off move after move. Add in several new gadgets to the utility belt plus all of the old ones from previous games and you have this constant fluid movement while surrounded by thugs. You can take them down several different ways making combat a joy to try out. Just drop in while a riot of 30, 50 or even more people is going on and just take on as many as you can, it never gets old. The major change in Batman Arkham compared to other games is the addition Batmobile. Since the streets of Gotham are empty you are free to drive however you need too. The Arkham Knight does not have henchmen he has an army, filled with completely automated drone tanks and helicopters. When you entered into Battle Mode the Batmobile becomes The Bat Tank. You spend a lot of time driving around taking out drone after drone and in many cases the entire mission requires you to switch between the two different modes. Every second you spend driving around and blowing stuff up is filled with non stop intense action because there is always several targets. The controls are smooth both when it comes to aiming your weapons and driving around. Upgrades to the drones and the Batmobile keeps things fresh and new and you look forward to the changes. Every Batmobile upgrade is useful and you will find yourself trying to figure different ways to use them. Batman Arkham Knight took us about 22 hours to get through the game in just the main storyline. With side quests like finding all of the Riddler Trophy’s, helping Nightwing stop the Penguin’s gunrunning and figuring out what Two Face is up to you could put 70+ hours into Arkham Knight. Plus, there is some extra missions unlocked after you beat Scarecrow. Another great game in the series and we hope this is not the last Batman game from Rocksteady. Batman Arkham Knight is an easy buy even at a newly released price. However if you see it at a under $30 then it is a MUST BUY PRICE!